Mind-mapping software Mindjet is setting their sights on the enterprise. 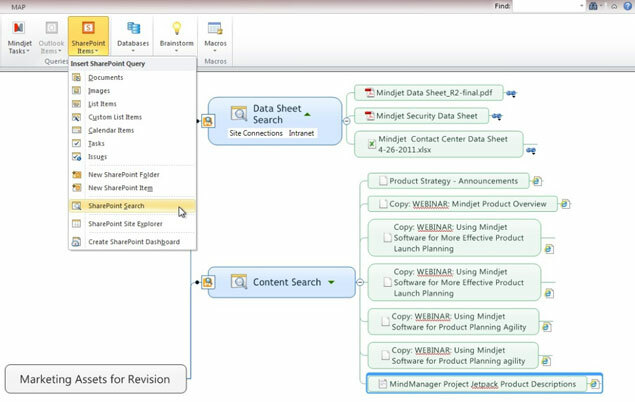 A new version of the immensely popular solution (influenced heavily by customer input according to the company) provides improved visualization, management, and communication of unstructured data through MindJet's intuitive information maps, but what makes MindJet's MindManager offering so enterprise ready in this version is that it allows users to leverage their existing SharePoint® infrastructure for task and project management. The MindManager solution is currently being used by over two million professionals (and within 83 per cent of the Fortune 100 by the way) according to the company. If you've never using a mind mapping solution like MindJet you're missing out as it's a powerful way to bring structure to today's influx of data, enhance project planning and management, and disseminate information in a highly visual way that encourages understanding and greater participation with stakeholders. Perfect for the enterprise. "MindManager Enterprise is the direct result of feedback from our customers," said Scott Raskin, CEO of Mindjet. "MindManager software revolutionized visual mind mapping, bringing versatility and creativity to strategic business processes. MindManager Enterprise allows organisations to fully leverage collaborative business mapping to improve key processes and information management at scale. Individuals and teams from all corners of the company can move quickly from ideas and research to completed projects, turning information overload into executable initiatives."